Starting in the 1930s, there was a haven for writers, artists, fans and anyone else who had too little money for the lives they wanted to live. It was a cafeteria called Clifton’s, in downtown Los Angeles. A kind and generous man named Clifford Clinton founded the place with the basic idea that people with little or no money could still get something to eat or drink. That seemed like the perfect hangout for a bunch of folks with limited budgets, so the local science fiction community began to go there to eat and talk. This group included Ray Bradbury, Ray Harryhausen, Forrest J Ackerman, Hannes Bok, Emil Petaja and many others, mostly from the chapter of the Science Fiction League that became the Los Angeles Science Fantasy Society. There are many stories, rumors, and outright lies told about what went on there, but one truth is that several of the folks who ate and drank for little money later became professionals in their fields. 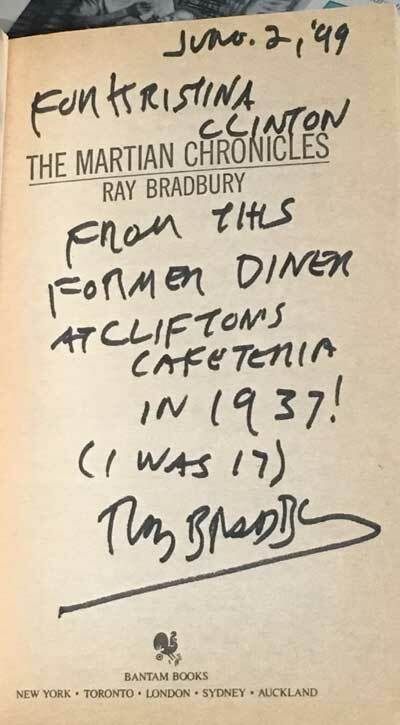 Ray Bradbury went on to write novels, short stories and plays for the rest of his life. Ray Harryhausen made monsters move, as he worked on numerous films with his stop-motion animation work. 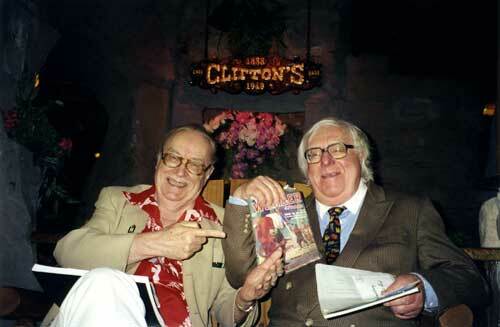 Forrest J Ackerman was an agent, writer, and editor, running Famous Monsters of Filmland magazine for many years. Hannes Bok, encouraged by his friends at Clifton’s, started submitting his artwork to magazines in New York, and spent the next twenty-five years working as a professional artist. Emil Petaja wrote numerous SF novels, some based on Finnish folklore, and helped to preserve the art of his friend Bok. The fans who were part of this group also created many things, in terms of writing, artwork, and the enjoyment of everything from oddball politics to the synthetic language Esperanto. Science fiction fans are nothing if not creative, even if their creations earn them nothing but the respect of other fans. Thus, they created fanzines printed on early mimeograph machines, with print runs in the dozens, sold or traded to other fans. These early fanzines, though, included writing and artwork by Bradbury, Ackerman, Bok or their friends like Henry Kuttner [later to become a major SF writer] and others. For some creators, these amateur publications were a way of honing their talents for future work. For others, the fanzines were and end in themselves. Not every writer wants to be a professional writer, and not every artist wants to be a professional artist. Some just want to have fun with their creative output, and not worry about what is commercial or most saleable. Book, The Martian Chronicles, 1988 ed. Mr. Clinton did one other amazing thing connected to science. After turning his restaurants [two in downtown Los Angeles by then] over to his children, he began work on feeding refugees after World War II. As part of that, he underwrote a research project at Caltech designed to create an inexpensive foodstuff, something that could manufactured for only pennies per serving. The result of this research was a soy-based food that was sold at the cafeterias for a nickel a serving, if you could afford it, or served for free if you couldn’t. This stuff could be turned into anything from a breakfast cereal to a fake meatloaf, depending on how you prepared it. Similar soy flakes were produced for many years and sold at health food stores.